New Map of Boston Giving All Points of Interest : With Every Railway and Steamboat Terminus, Prominent Hotels Theatres and Public Buildings. 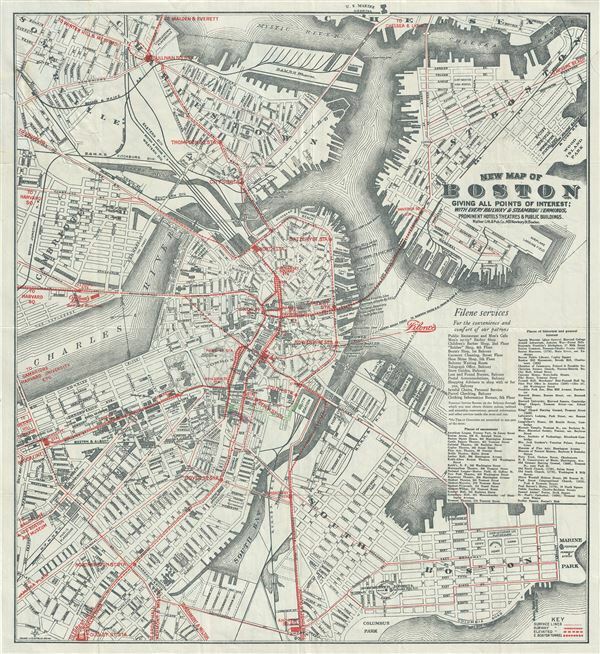 This is a beautiful 1926 map or plan of the city of Boston, Massachusetts by the Walker Lith. and Publishing Company. Published by the Filene's Sons and Company, it covers the city of Boston from Charlestown and Somerville to Columbus Park in the south. Individual streets, important buildings, neighborhoods, parks, piers, railway and ferry lines, subway lines and other topographical features are identified. The map also marks the location of the Filene's Department Store and Service Building. A list of various places of amusement and places of historical and general interest are noted, along with their addresses, along the right margin. An advertisement detailing the various departments of the store is also included. This map was issued by the Walker Lith. and Publishing Co., 400 Newbury St., Boston. Very good. Minor wear along original fold lines. Minor damage and verso repair in top left quadrant. Professionally flattened and backed with archival tissue. Manuscript markings in green near center of map. Verso contains a New England Tour Map.